This discussion is related to the Pockets addon. Just upgraded to Vanilla 2.3 - unfortunately, Pocket plugin does not work. I just setup my discussion board over the past couple of days using Vanilla 2.3 - I installed Pockets just last night and it seems to be working fine for me? @StanleyH - really, I don't think so. Pocket does not work on Vanilla 2.3. Are we (@Ionmarcu and @Prosper) the only ones having this problem. @Todd, @Linc, @vrijvlinder, @R_J, @whu606, @River, @hgtonight - assistance is needed please. The "SettingsController" object does not have a "xsetHighlightRoute" method. 180: // Make sure the arguments get passed in the same way whether firing a custom event or a magic one. If you are a user of this website, you can report this message to a website administrator. If you are an administrator of this website, you can get help at the Vanilla Community Forums. Did you delete the old plugin before using the new one ? No, I did not. I uploaded the new one to overwrite the old one. Sometimes if a file is in the wrong place, you don't overwrite that one. It is best to disable, delete and re upload. This happened with the YAGA plugin. The author updated it and had changed the location of some files which did not get overwritten and made the plugin malfunction. Try that and report back. Ok but will I loose the html files on have on the old Pocket plugin if I delete Pocket plugin first before uploading new one? Save what you entered in the the old plugin, then delete the plugin. Yes you might lose it..
@vrijvlinder - it seems class.pocket.php file is missing. Can you take a look? No, it is there.. it is in the library folder of the pockets plugin. Please look at it at github. it shows every file and folder. Pockets is missing the following requirement(s): Vanilla 2.4. It seems to work but clicking on setting button throws "Fatal Error page" shown below. Also both disabled and enable html codes already on the pocket plugin all seems enabled. Thiis just strange. What can I do next? Ok, I have submitted an issue. "Does not work" is hard to debug. I used the old 1.1.2 version and it did work for me. Now I've installed the version 1.1.3 and it is still working. 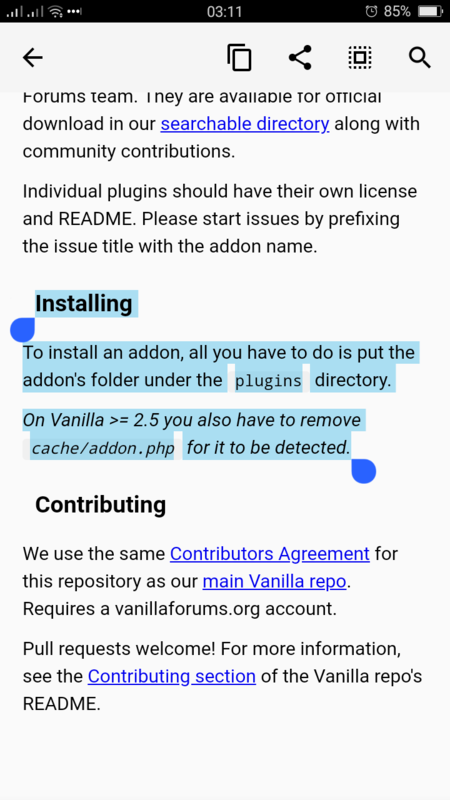 Afterwards I've tried version 1.2 from https://github.com/vanilla/addons/archive/release/2.2.zip which is also working for me. The most current version from GitHub, which explicitly states that it needs 2.4, is not suited for your 2.3 forum. So please delete the current folder /plugins/Pockets, download the version 1.2 from here (I have just uploaded it) and tell us what "not working" means in detail. Pocket version 1.2 just updated few hours ago works. Hi Guys, I tried to delete and disabled the plugin (Pockets) before installing the latest version at the moment with latest vanilla forum but the plugin doesn't seem to show the updated version. Is it because of cache? How do we delete the cache? I need some tip. Thanks. Will try this out. Be right back.